Suppose the two parents of a child have blood groups A+ve and O+ve, and the child has O-ve type. 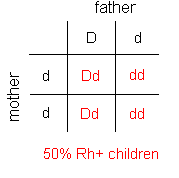 For blood group, there are two alleles. Since the child has O, the father must have one 'A' allele and one 'O' allele. Does such a reasoning hold for the Rhesus factor too? Should I interpret that both the parents have one + allele and one - allele? 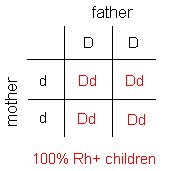 Rhesus antigen (Rh-D) is inherited in an autosomal dominant pattern. Therefore you are correct in your reasoning. Simple problems like this are often best worked out using Punnet Squares, shown below for the scenarios you have considered. Because the inheritance pattern is dominant, if either parent was homozygous (DD) for Rh-D then 100% of their offspring will be Rh+ve. In this situation 3/4 of the children are rhesus positive and 1/4 rhesus negative. In this scenario, half of the children are rhesus positive and half rhesus negative. Not the answer you're looking for? 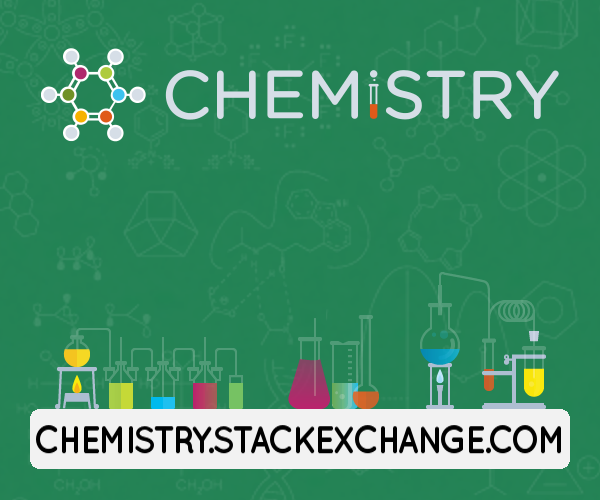 Browse other questions tagged hematology blood-group or ask your own question. Why do so many people have group O blood? Do Marsupials have a standard classification system for their blood groups?